There’s no such thing as a perfect car, but in the world of compact premium SUVs, the 2018 Audi Q5 comes really close to achieving perfection. At least that’s what Kelley Blue Book’s review claims, which found only a few negatives and an onslaught of positives. Starting with the faults, it’s worth noting that sitting in the middle of the backseat of a Q5 can be a bit of a struggle, so it’s best to save that spot for a child. Then there are the small cup holders, which could bother people who like to carry bottles around and not just regular plastic cups. Finally, you can’t interact with the Q5’s infotainment screen by using your fingers, which is a shame since features such as Apple CarPlay are best enjoyed via touch. As for the positives, there’s a high-quality cabin, which boasts comfortable seats and solid overall tech features. 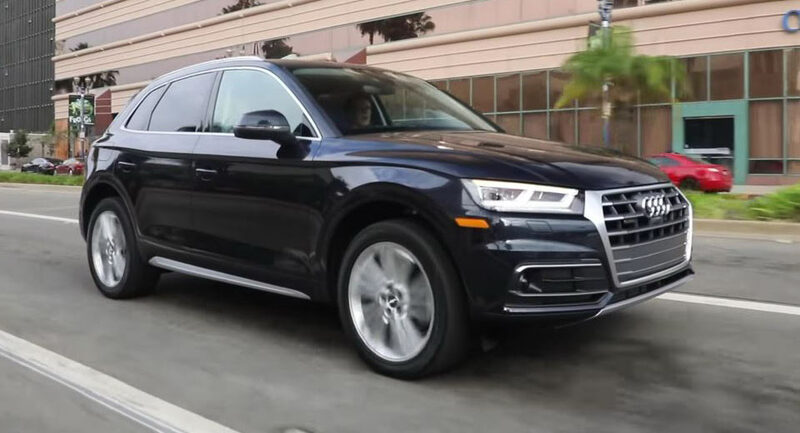 On the road, the 2018 Q5 is composed, agile and quick, even with the turbocharged 2.0-liter four-cylinder engine, which provides “refined power delivery and spirited acceleration.” Its seven-speed dual-clutch automatic shifts rapidly, while the standard quattro AWD system offers you peace of mind on slippery surfaces. If speed is your ultimate concern, perhaps you might want to consider the SQ5 version. Still, even the regular Q5 really stands out in a very competitive segment that includes rivals such as the Mercedes GLC, BMW X3 and Volvo XC60 – but you can see for yourselves in the video that follows. It could be perfect, it would not save it from being incredibly boring. It attains awesome levels of not-giving-a-f*ck design. The whole Dacia range looks more exciting. Exactly. It looks like a very handsome mini-van, a serious, corporate people mover, rather than a beautiful vehicle exuding any degree of emotion. Why then do I not want one? Because this is made specially for people that want a decent, nice car, nothing more, nothing less. A solid piece let down by the 7-speed DSG. Yes, the shifts are fast, and yes, it makes the car quicker than the power numbers would suggest, but it can be laggy and lumpy in stop-and-go driving. You shouldn’t need to step up to an SQ5 to get a decent powertrain. VW should dump their DSG and just use Porsche’s excellent PDK for every brand under their umbrella. I got one and this is a pretty accurate review. But despite it being really so, so good at everything, I cannot deny, it is a little boring. I really wanted an XC60 R-design but the lease was ~$300 more per month. Seems perfect for over 50’s. Not really, I’m in that demographic and thought it was a snoozer. I opted for a XC 60 Inscription and can’t be happier. Interior design is far superior to the Q5.